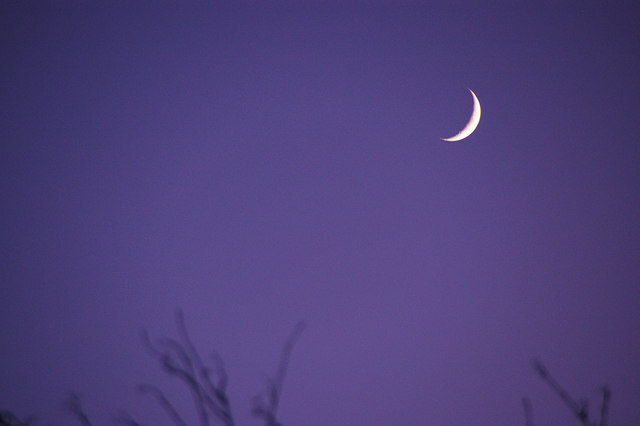 Moon Musings: The Waxing Crescent Moon -- which falls on January 4–5, 2014, is a time to set goals for positive changes in your life. Waxing crescent moon. Image from Wikimedia Commons. Waxing moons are times to set new goals, recognize new objectives, promote new growth, and set forces in motion to help you achieve these goals, objectives, and growth. The first weekend of 2014 is an auspicious time to start working, both long- and short-term, with the goal of manifesting positive changes in your life. On Saturday, Lady Moon is in Aquarius, the sign that foreshadows coming trends and emphases; on Sunday, Lady Moon is in Pisces, the sign that incorporates energy from all the signs of the Zodiac; either of these days will generate nicely positive energy to facilitate your intentions. It is best to start your activities at or near sunset. Invoke your favorite goddess-as-virgin deities. They will add helpful energy to your ritualing, which should increase the likelihood that you will be successful in your endeavors during 2014. As you organize your plans for the New Year, don’t shy away from the thought that plans may need modification as they progress. Be prepared to be flexible as circumstances may dictate, while not losing sight of your ultimate objectives. This may also be a good time to plant above-ground crops such as lettuce and spinach. Lettuce can take a light freeze and will do well in the central Texas area if seed is sowed at this time. On Saturday, January 4, Saturn rules. His emphasis is on self-discipline, which can be helpful as you set your goals and objectives for this year in general and this moon cycle in particular. On Saturday, January 4, Saturn rules. His emphasis is on self-discipline, which can be helpful as you set your goals and objectives for this year in general and this moon cycle in particular. Use the color black, make sure you have contact with the element Earth in some way (not necessarily barefoot and outdoors; holding a small potted plant will do just as well), and repeat your chant 3 times. On Sunday, January 5, the Sun rules, giving emphasis to money matters, health issues, and friendships. Use the color yellow, have a candle burning for the fire element, and repeat your chant 6 times. New beginnings, fresh objectives; I’m prepared to do my part. Plans and actions now in sight; this is when and how I start: Sowing seeds in heart and mind, planning steps both long and short, Open to unfolding options of whatever sort. May the New Year bring us all a calmness of spirit, a joyous heart, economic stability, and delight in all things. I urge you to find something each day that prompts smiles or laughter, for they are the most basic tools we humans have to dispel gloom and keep us moving forward!